Sony PlayStation 5 rumors are heating up after details about the next-gen console were revealed. Here’s what we know so far about these rumors. A recent interview from Wired gives a look at what Sony’s (NYSE:SNE) next-gen console will be like. Sony’s Mark Cerny spoke about the console during the interview. It’s worth noting that Cerny never refers to the console at the PlayStation 5. Despite this, the Sony PlayStation 5 rumors are heating up. What Cerny does confirm is that this won’t be a mid-console upgrade. It’s also worth pointing out that Cerny says this console won’t be coming out anytime this year. The details about the video game console also include that it will feature a Solid State Drive (SSD). Also among these details are that it will include a graphics card that is able to support ray tracing. It will also be using a processor that is based on AMD’s (NASDAQ:AMD) Ryzen line. Cerny mentions that this next-gen Sony console will also be compatible with the PlayStaion VR headset. It will also be using the same architecture as the PlayStation 4. This means that the console will be able to play games that came out on the PlayStaion 4. It’s also worth pointing out that the console won’t be digital only and will accept physical media. You can learn more about the Sony PlaySation 5 rumors by following this link. 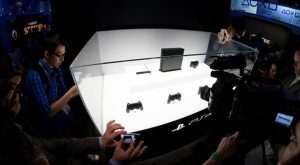 Article printed from InvestorPlace Media, https://investorplace.com/2019/04/sony-playstation-5-rumors/.